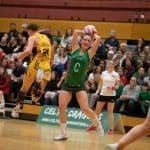 It was not the best of starts for Celtic Dragons as the team was made to make a very early substitution with wing-attack Suzy Drane seemingly having suffered a calf pull in the warm-up. Her very able deputy was none other than Bethan Dyke who immediately set about darting around the court in her usual style. Nevertheless, this disruption allowed the visitors to make a very positive start, with Stars and Wales shooter Georgia Rowe getting a three-goal advantage. Dragons were clinical in attack and did not allow the away side’s lead to grow too far and then it was down to some great work in defence, particularly a couple of tips from Stacian Facey, to get the Dragons back to level by the quarter time break. It was a pretty even game for much of the second period. Both sides were able to drive off their centre pass quite effectively and it was only then an uncharacteristic miss under the post from Rowe that gave Dragons the edge. It was followed by another miss (this time at long range) that Dee Bolakoro was able to regather and she teamed up with Kalifa McCollin who fed the ball in to Chelsea Lewis at lightning speed. Dragons had all of the momentum and it was only in the last minute of the quarter that Stars found a way to stop the rot and limit the damage going into half-time. The final fifteen minutes of the game began in unremarkable style. Dragons had a healthy advantage and came out as clinically as expected. However, within a couple of minutes, Chelsea Lewis had taken a knock and was forced off, to be replaced by Eleanor Roberts. Roberts immediately scored her first and there was little wrong with her radar, rather, the team’s manner of play seemed to change. Far less assertive in attack and with some ridiculous passes being flung up from mid-court, Stars could sense an opportunity. Within a four minute period, Stars had overturned a 5-goal deficit to lead as the Dragons started to lose touch with reality. 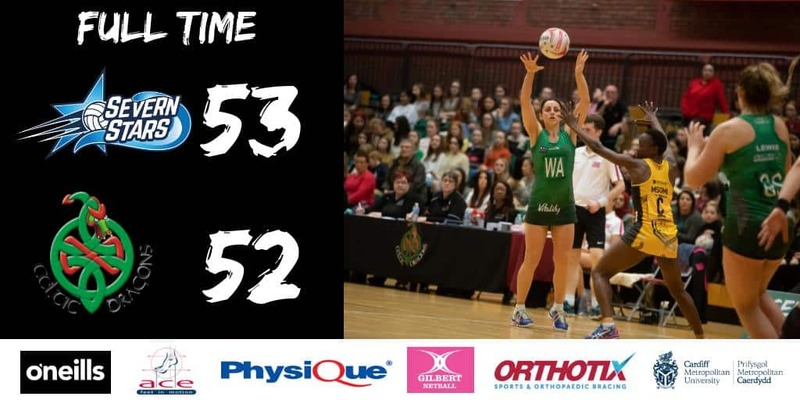 With five minutes to go, Lewis was able to return to court, but by this time the team was in disarray and despite a frantic last couple of minutes Stars were able to grind out their unlikely victory. 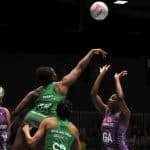 Celtic Dragons: GS C Lewis, GA K McCollin, WA S Drane, C K Jones, WD N Jones (capt), GD D Bolakoro & GK S Facey. Replacements: B Dyke, C Elsley, E Nawele, E Roberts & A Tyrrell.